Parts are EXTREMELY FLEXIBLE (See Video). Won't Break on Speed Bumps Like most Parts will. Body Kit is constructed of FRP (Fiberglass Reinforced with Plastic), Makes Installation a Breeze. All the Durability Benefits of Urethane at 1/2 the Weight and 1/2 the Cost. Please Note ALL parts come with minor defects and imperfections. Scratches, Cracks, and Chips in the Protective Coating are Normal and Will be Removed During the Prep Process. Please be sure to test fit parts before prep/paint! Extreme Dimension's new DURAFLEX technology is a revolutionary product which combines fiberglass, plastic, and flex resins to obtain its unique features. Every DURAFLEX product is inspected through a rigorous quality control process giving consumers the highest quality product available with superior craftsmanship. DURAFLEX products come finished with a flat black primer, high quality mesh, hardware kit, and an installation guide. With such attention to detail, DURAFLEX products are surprisingly affordable, roughly 50% of the cost of a comparable high quality JDM product. DURAFLEX products include many advantages of both fiberglass and poly- urethane aerodynamics, while leaving out most of the disadvantages. In essence, our new DURAFLEX products will give you the highest quality product at the most affordable prices. Please inspect package upon arrival, remove wrap, and inspect all pieces. If there are ANY damages make sure to MARK''DAMAGED'' on the way bill. Air Quotes available upon Request. Remote locations will cost extra. 95% of our kit arrive in under 2 weeks! 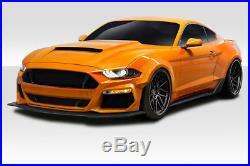 Free Body Kit Promotion: Every order placed is an entry to win. Winners will be picked at random on the 1st of the following month. For updates, please follow our Facebook. Pages under Express Aero Kits. Policy on Guaranteed fitment: If there is a fitment issue we will need to see full length pictures showing the entire part on the vehicle or preferably a Video. More pictures you can provide the faster we can fix. Back Orders: Back orders are very common in this industry. If your product is back ordered we will notify you and you will have the option to cancel free of charge. Test fit items before installation. Best practice is to accept the item and let us fix any issues. Parts that have been altered can NOT be return. All Sales are Final: Parts are unfinished and will require modification to obtain a finished product. Installation: All parts must be prepped and installed by a professional body shop that has experience working with unfinished fiberglass car parts including but not limited to cutting, heating, filling, sanding, and shaving. Removal of the bumper reinforcement bars maybe necessary to mount/hang front and rear bumpers. While most emails are answered within 12 hours please allow up to 48 hours to receive a response. We are not in on weekends or holidays. 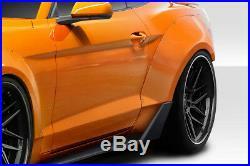 The item "18-19 Ford Mustang Grid Duraflex Full 8pcs Fender Flares Body Kit! 115125" is in sale since Thursday, December 20, 2018. 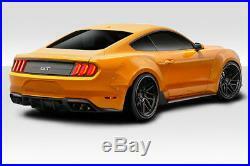 This item is in the category "eBay Motors\Parts & Accessories\Car & Truck Parts\Exterior\Body Kits". 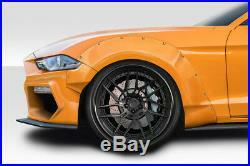 The seller is "express_aero_kits" and is located in Garden Grove, California. This item can be shipped to United States, all countries in Europe, all countries in continental Asia, Canada, Australia.